I cut two images so that I could have the decorative side panel recessed. I like that this gives a stronger silhouette without loosing any detail. I carefully layered my papers to show off particular parts of the design. I added a sticker sentiment, raised the red label, then finished with a loopy bow topped with a star charm. I hope you like it! 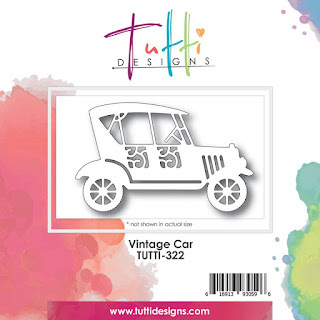 Our Vintage Car die is so versatile and will work with any occasion, so do check it out. Purchase your Vintage Car die HERE today! You never cease to amaze me with your creations Autumn ... this is FABULOUS! What a wonderful collection of papers & embellishments! Awesome inspiration ... thanks so much! Great Designer Papers and I adore that Vintage car die. This looks like a 4th of July Parade...so FUN!!! I also love all of those beautiful layers, this is awesome!